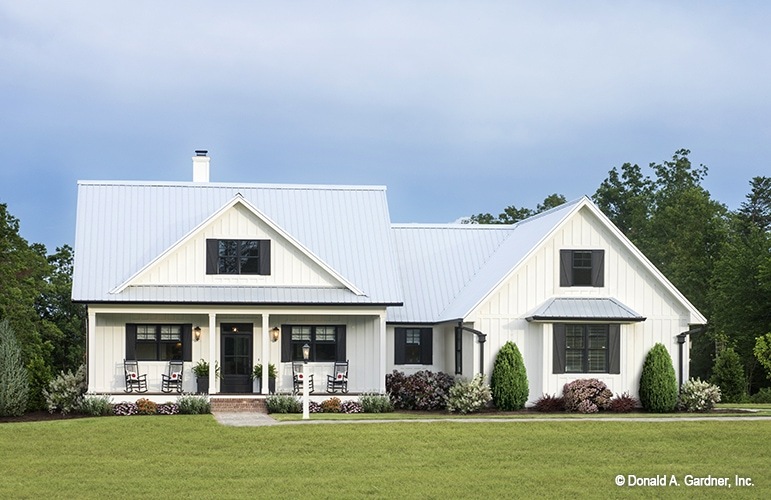 It’s hard to escape the modern farmhouse trend, which marries contemporary style and a rustic, country vibe. 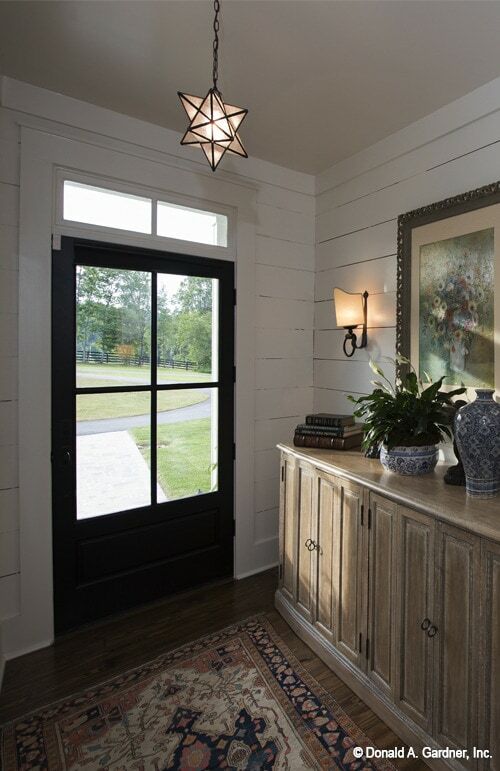 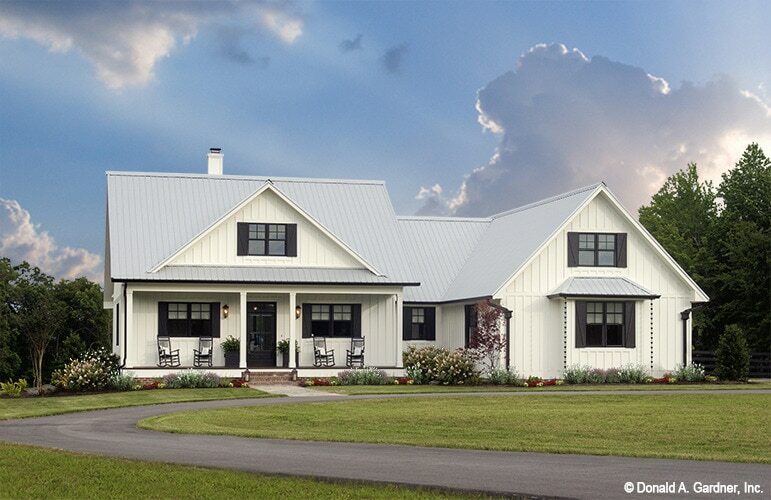 Whether you’re building your home on 20 acres or just a small lot in town, the modern farmhouse style can blend into any environment and stand out for unique architectural beauty. 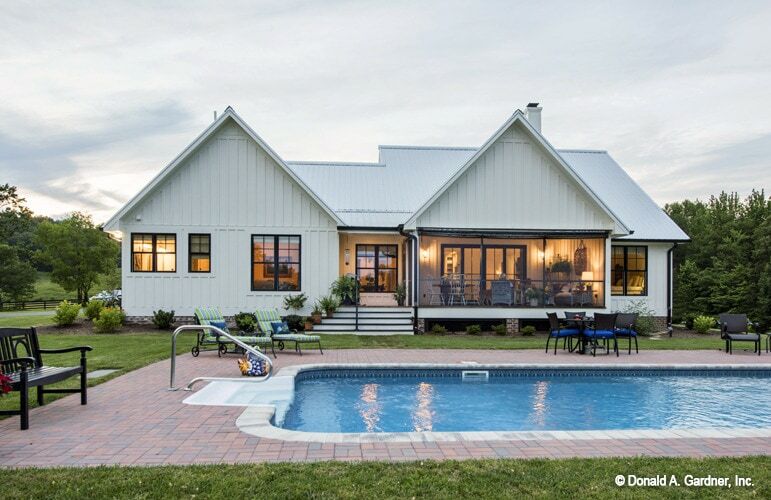 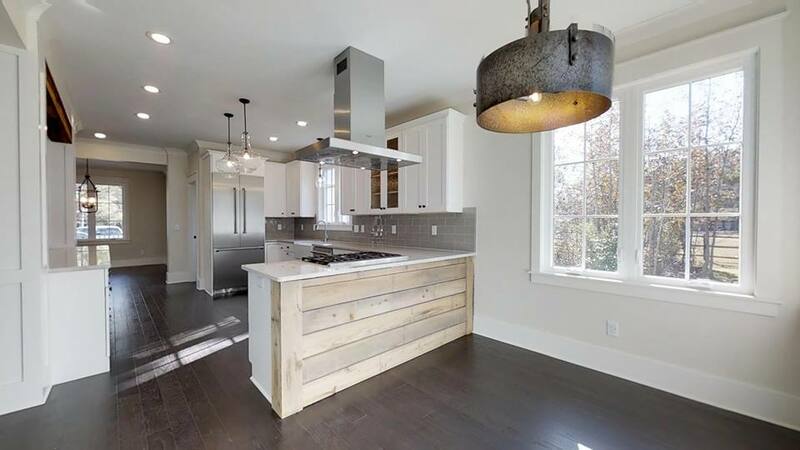 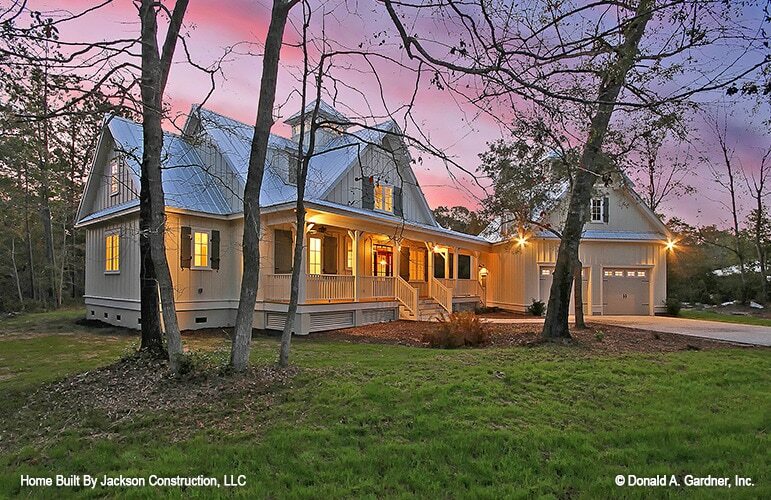 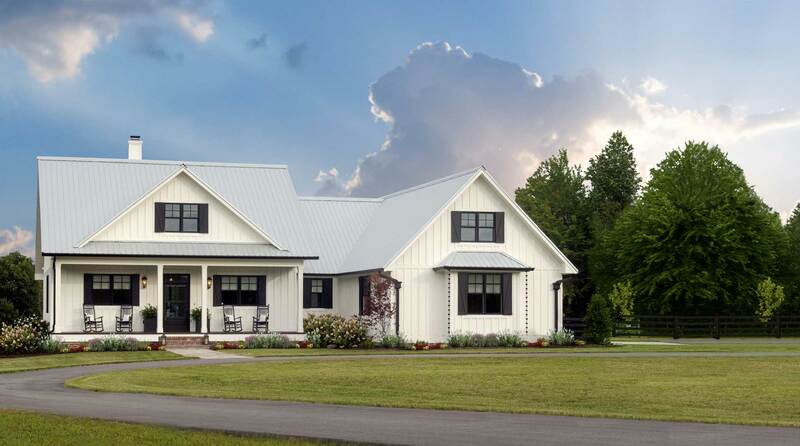 Award-winning architect Donald Gardner offers several modern farmhouse plans that redefine this popular trend that we are pleased to annouce can now be purchased online. 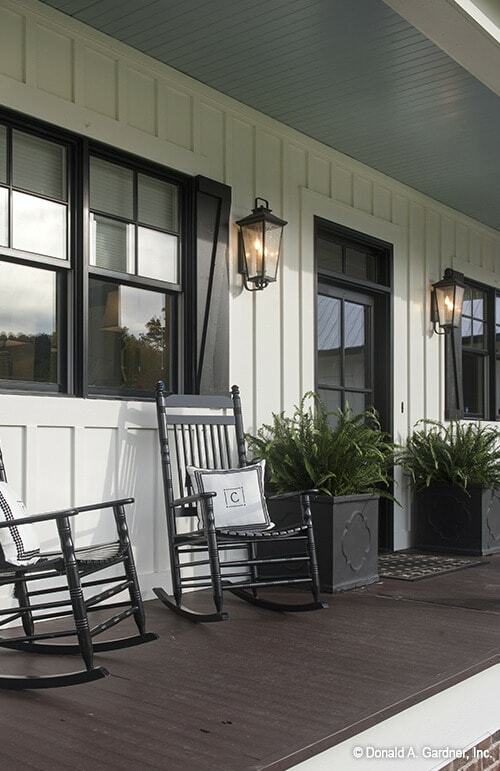 Offering a traditional, charming farmhouse exterior, The Coleraine features a country porch with prominent gables and eye-catching brackets. 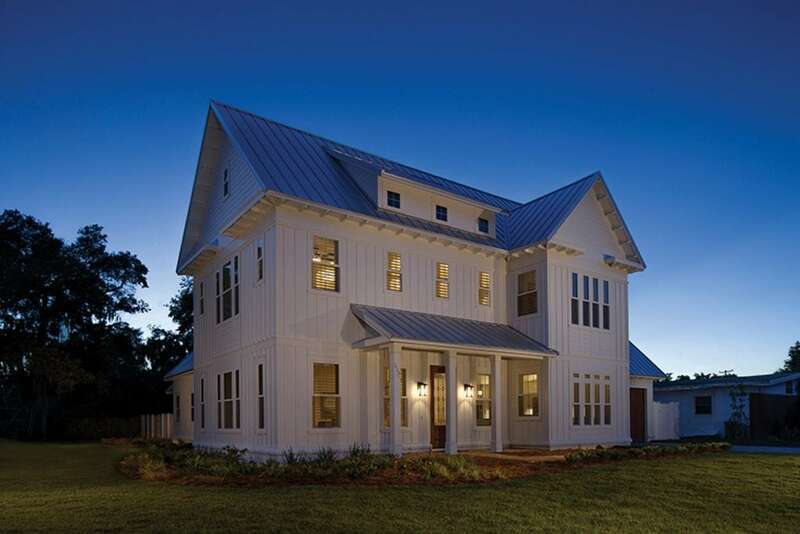 The home offers 1,905 square feet of living space with 3 bedrooms and 2 bathrooms across 1 story. 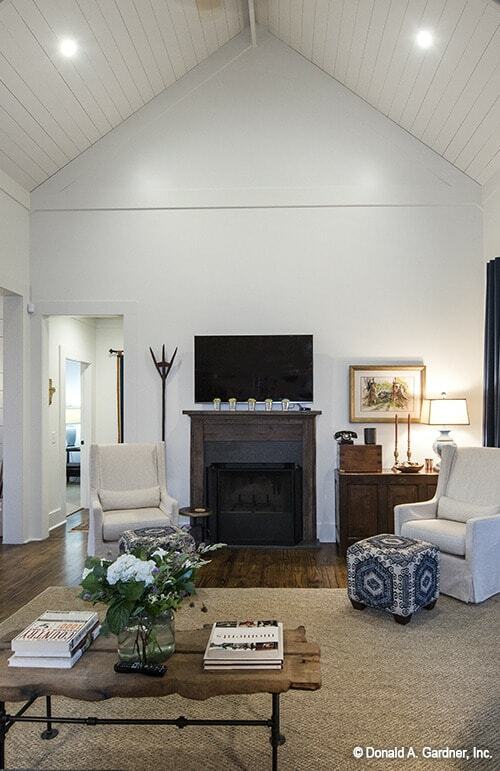 The open floorplan offers cathedral ceilings in the dining (10’ x 16’ x 19’5”) and great (17’4” x 16’ x 19’5”) rooms. 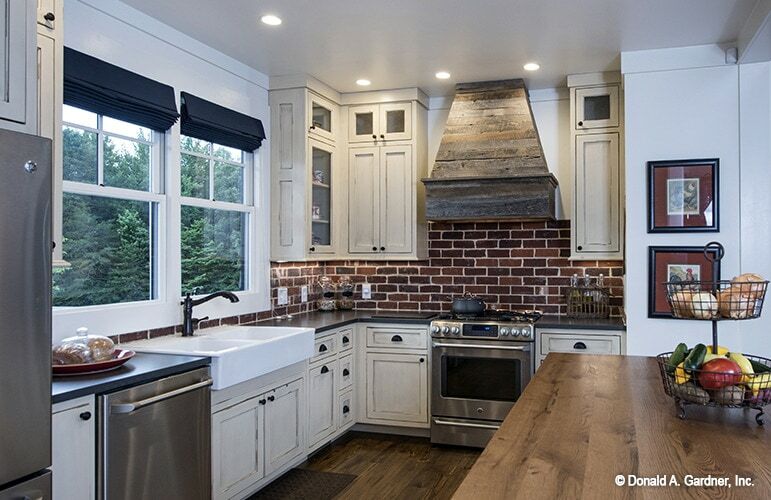 Bar seating in the kitchen allows guests to mingle as you cook and entertain. 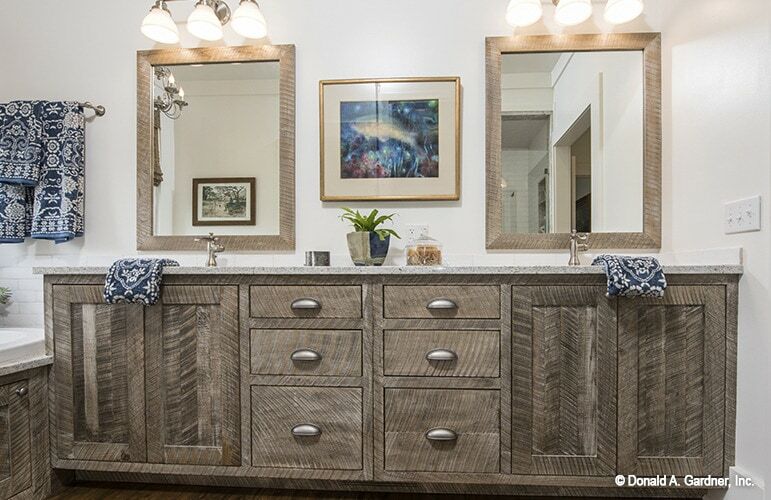 A mud room off the garage offers closets, pantry space and even an e-space for recipe searching. 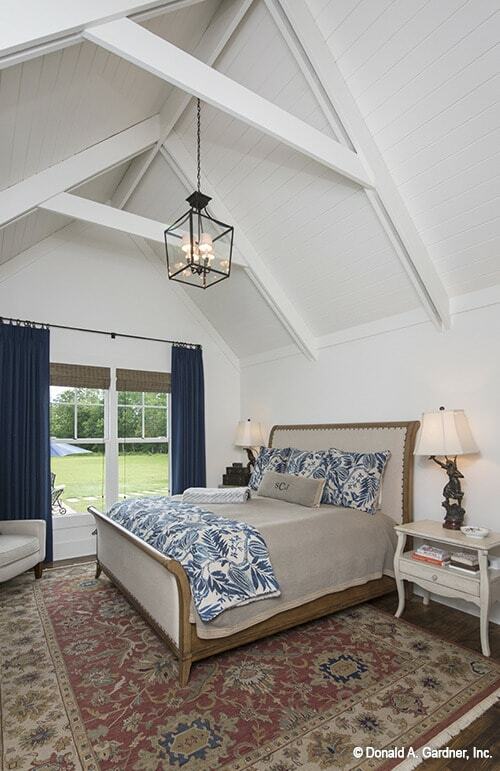 The master suite (13’ x 16’ x 16’3”) features two walk-in closets as well as a linen closet for extra space. 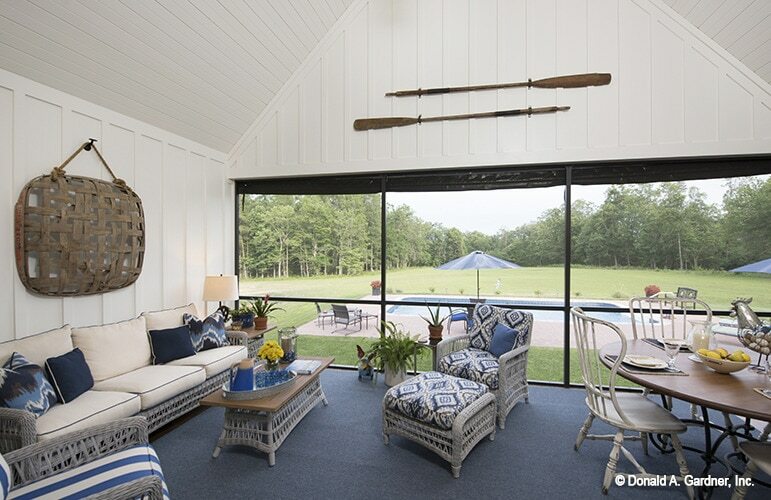 Windowed walls in the sunroom allow natural light to flow through the space. 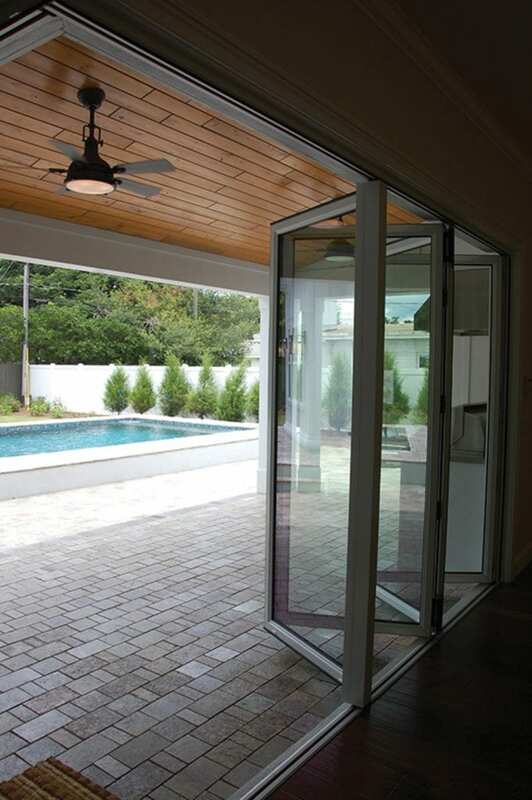 Alternatively, you can turn this space into a screen porch to enjoy those cool summer evenings with friends. 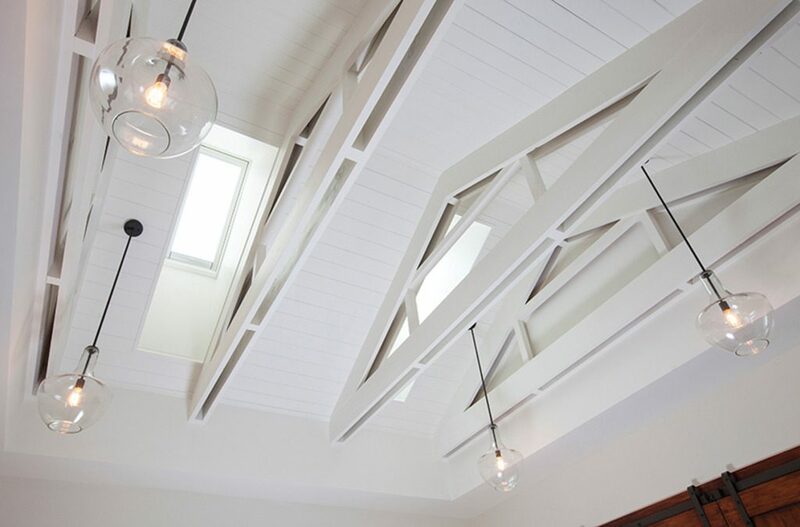 A bonus room can be added, which adds 472 square feet of living space. 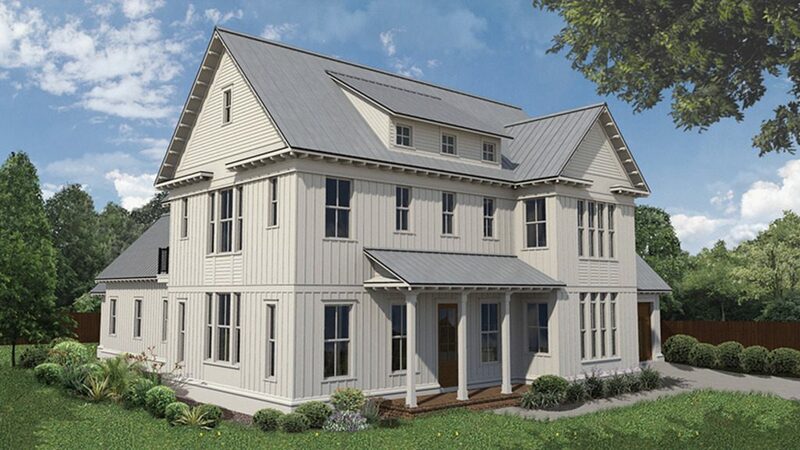 The Gloucester offers 2,018 square feet of living space, 2 bedrooms and 3 bathrooms across 1.5 stories. 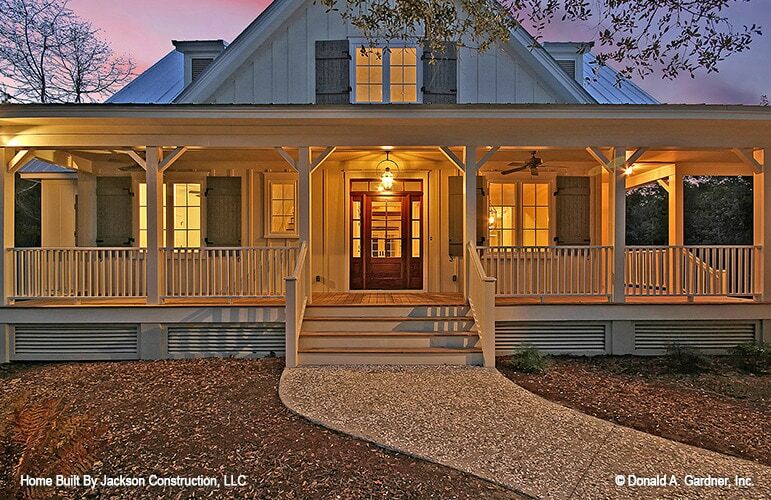 The farmhouse wrap around porch options create an inviting outdoor space that’s perfect for evening conversation. 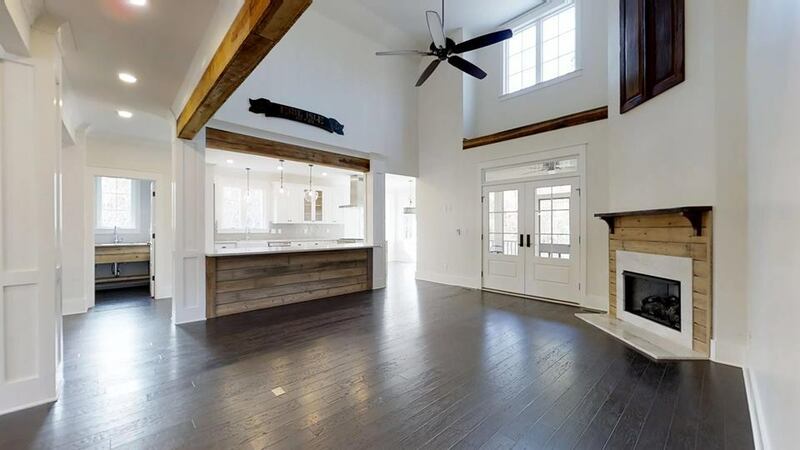 The home features an open floor plan, with a single column defining the perimeter of each room. 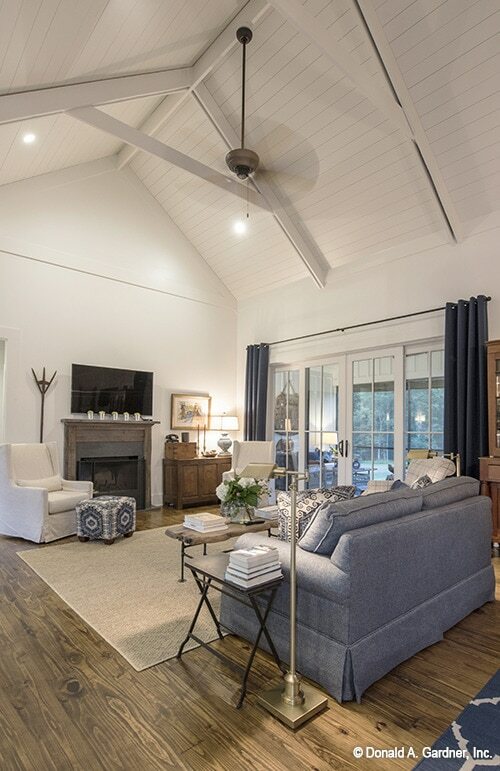 The great room (17’9” x 16’7” x 18’1”) offers many amenity options, including porch access, fireplaces and a two-story ceiling. 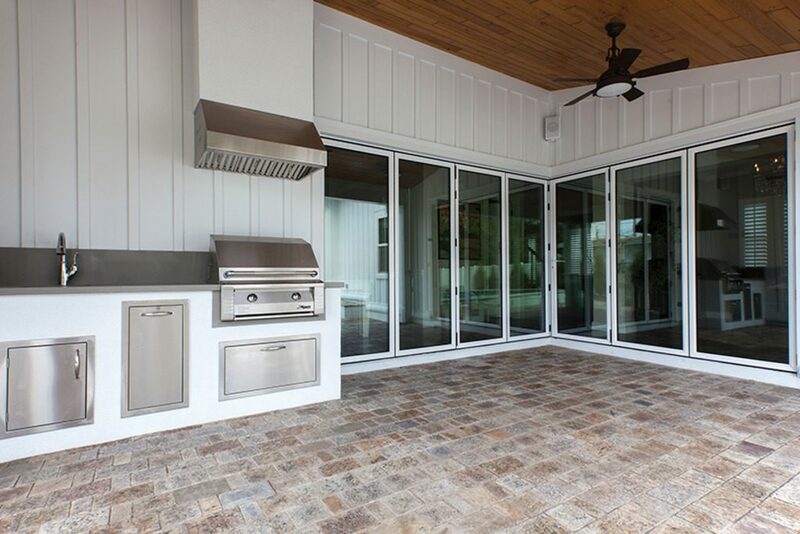 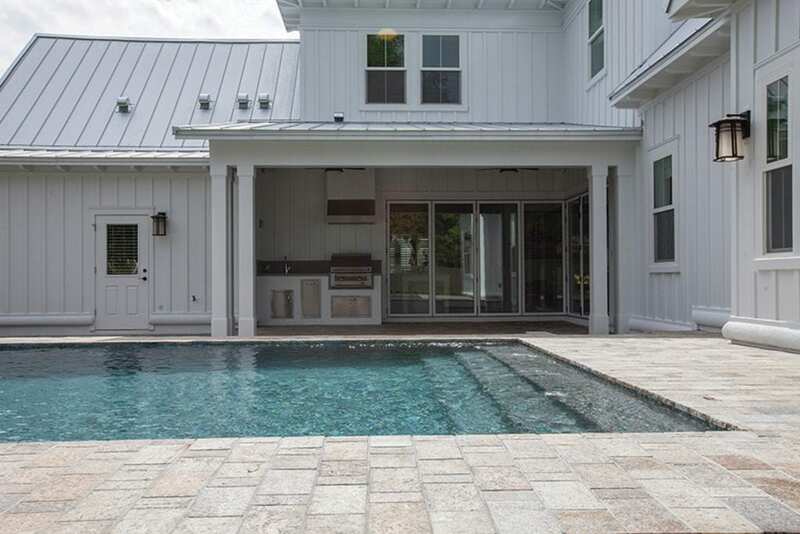 The kitchen, which is open to the dining area, leads to a screen porch for easy entertaining – indoors or outdoors. 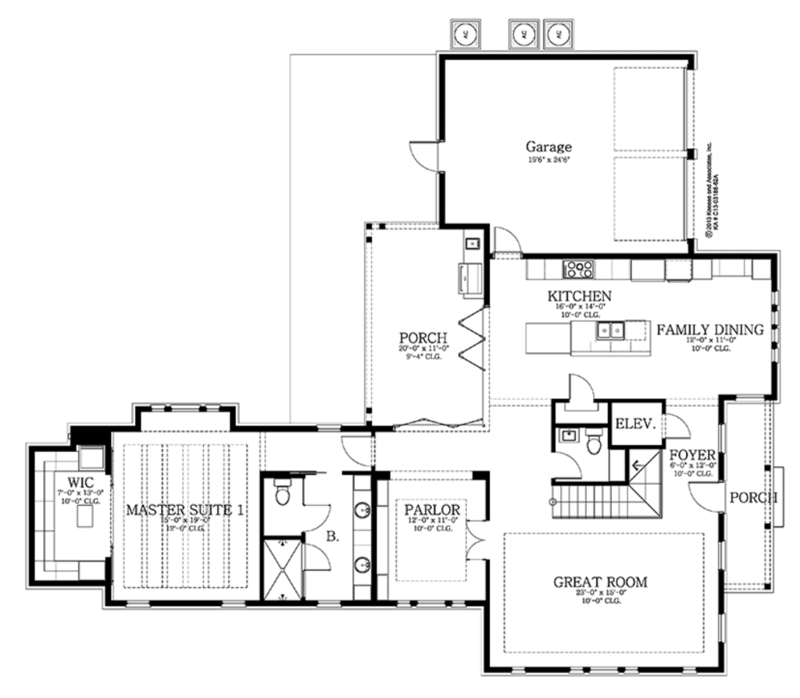 The master suite (14’4” x 15’ x 9’) is located at the rear of the home, overlooking the rear porch. 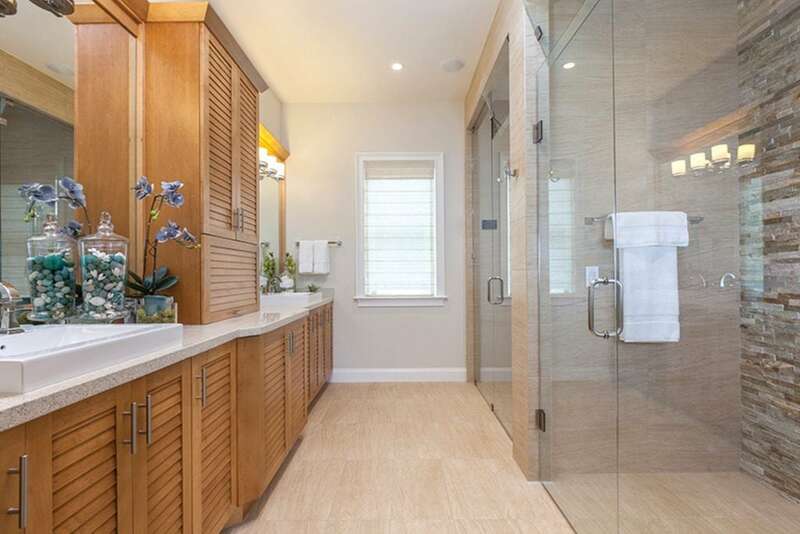 There are two walk-in closets for storage, and the master bath features a separate tub and shower. 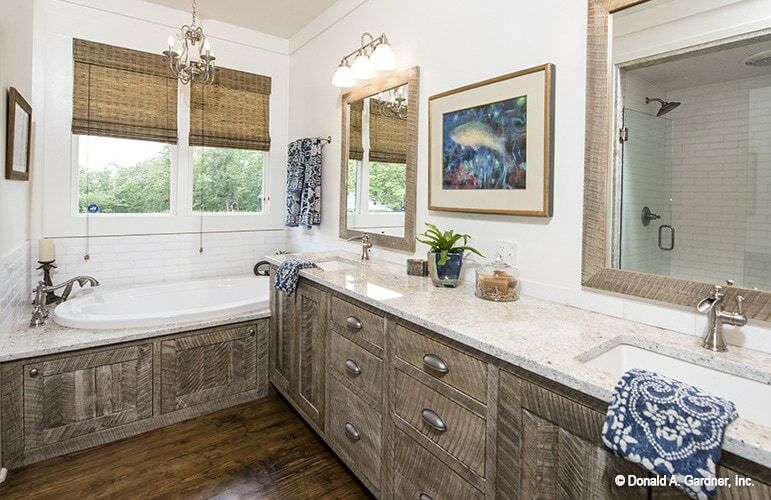 His-and-her sinks and a private privy give the master bath a luxurious feel. 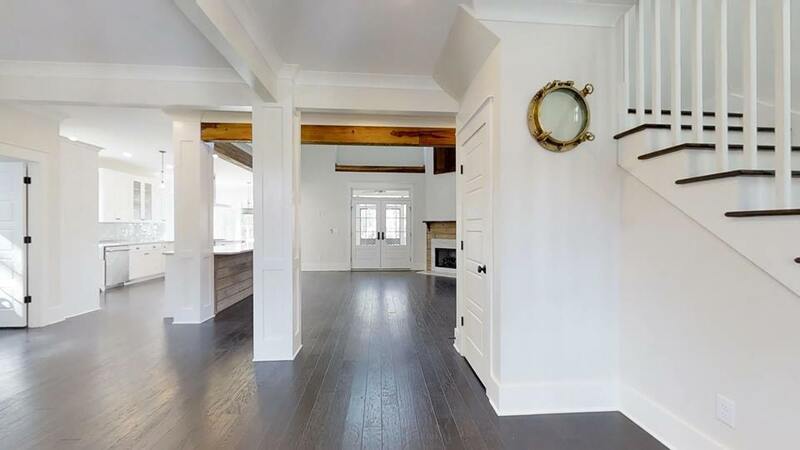 The first floor (1,709 sq.ft.) 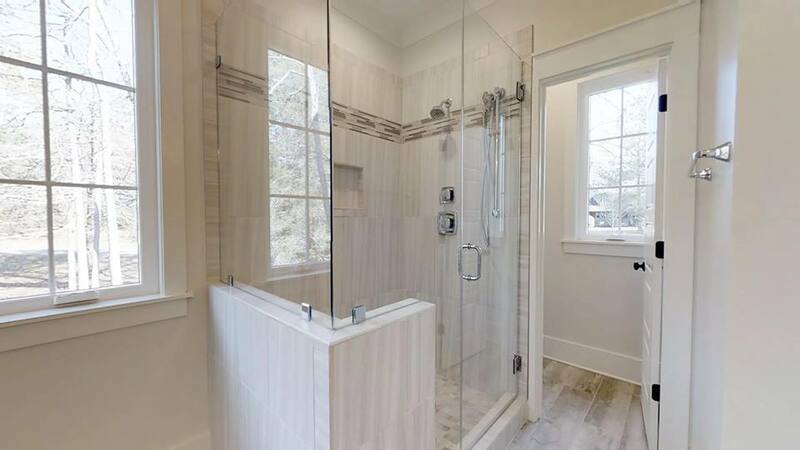 also features a bedroom/study with its own bath. 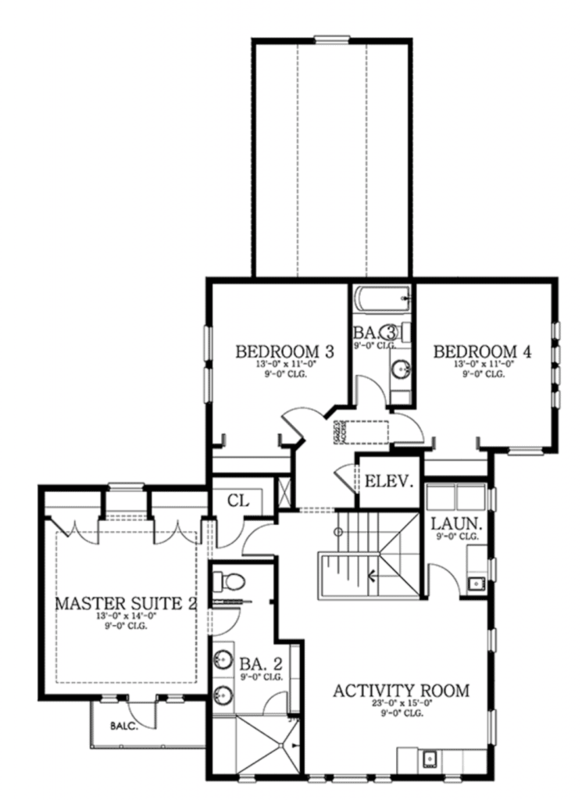 The second floor (309 sq.ft.) 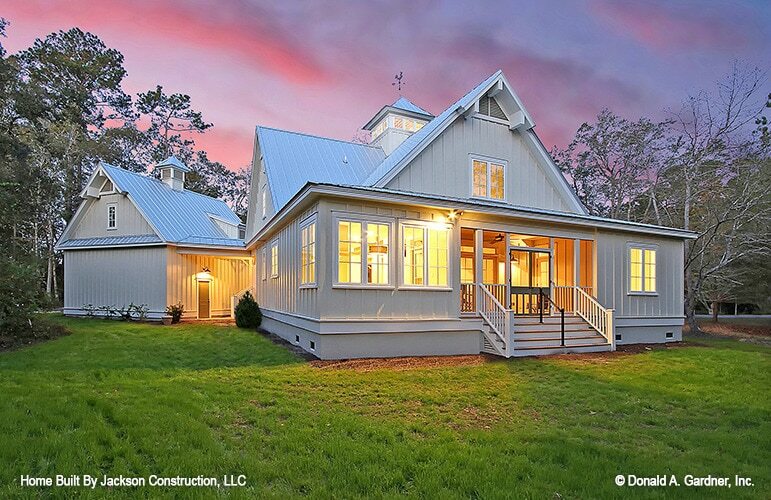 features a bonus room, bathroom and loft. 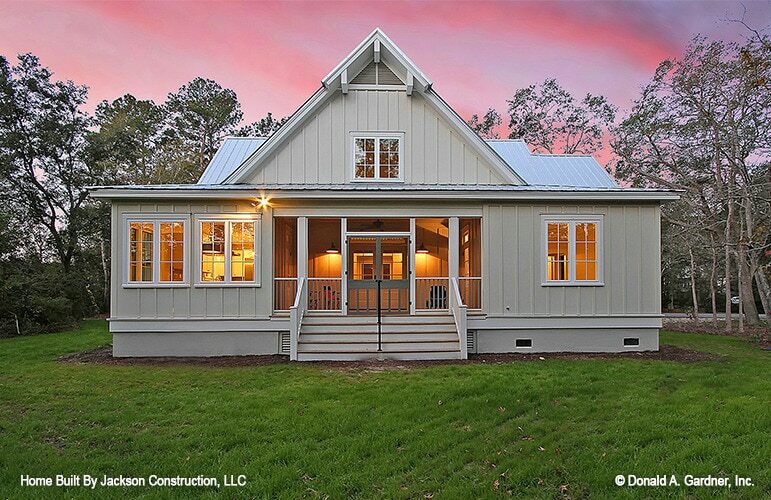 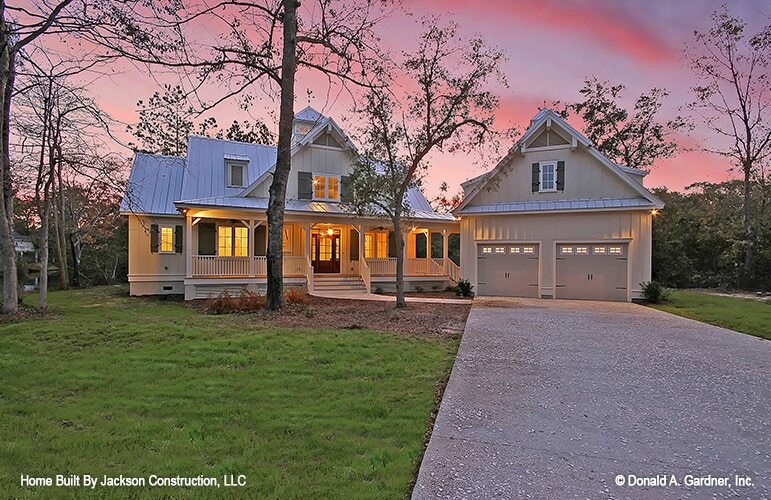 A true masterpiece of craftsman style with modern flair from DreamHomeSource.com. 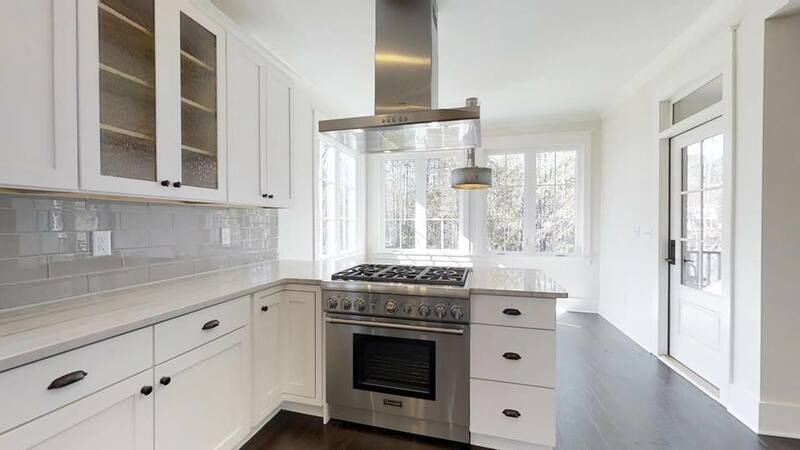 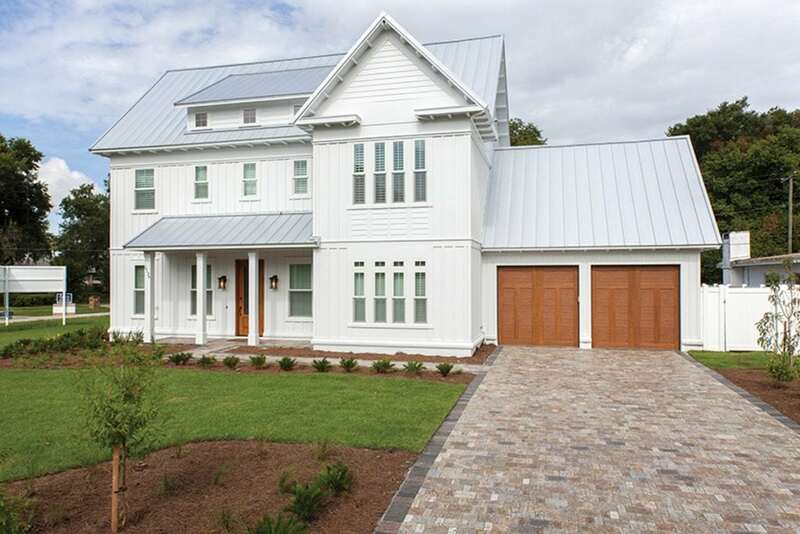 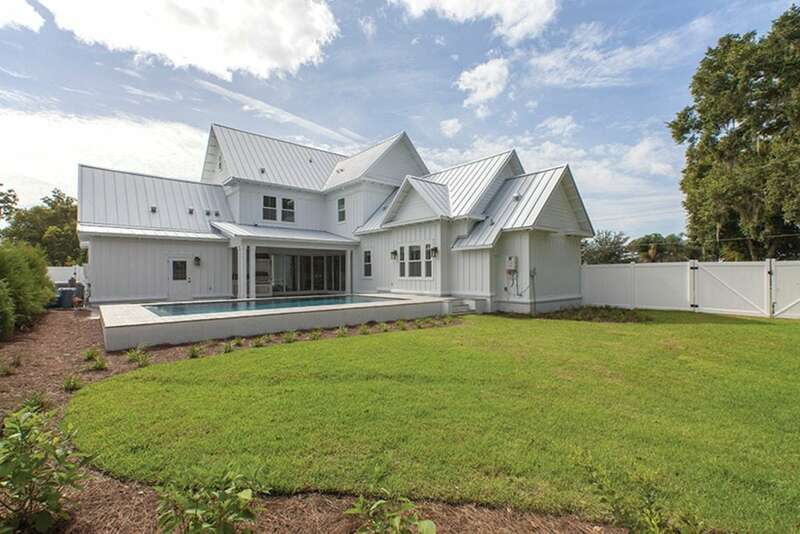 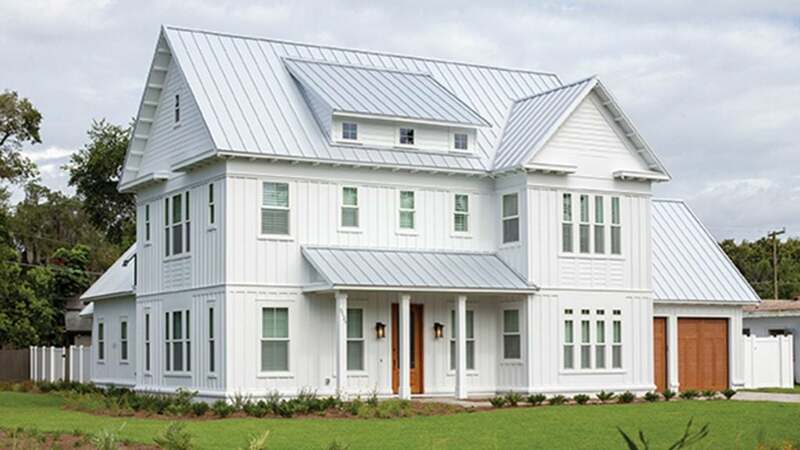 With a metal roof and optional panels, this home carries old world charm with modern conveniences. 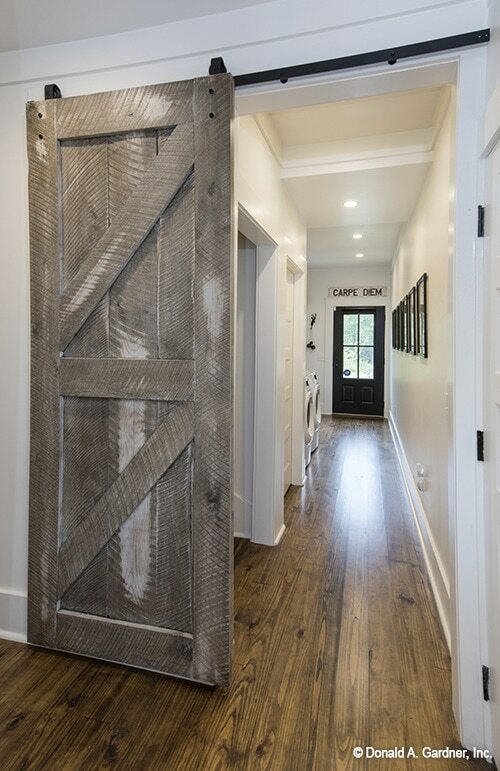 We will let the pictures do the talking…. 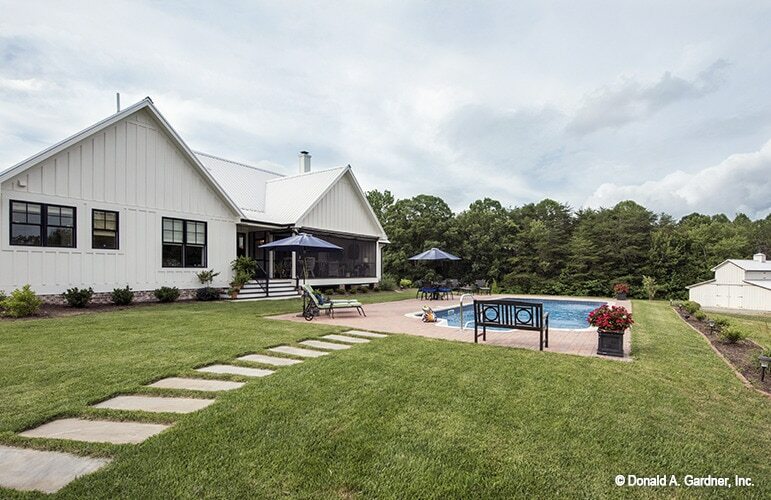 All images courtesy of DreamHomeSource.com. 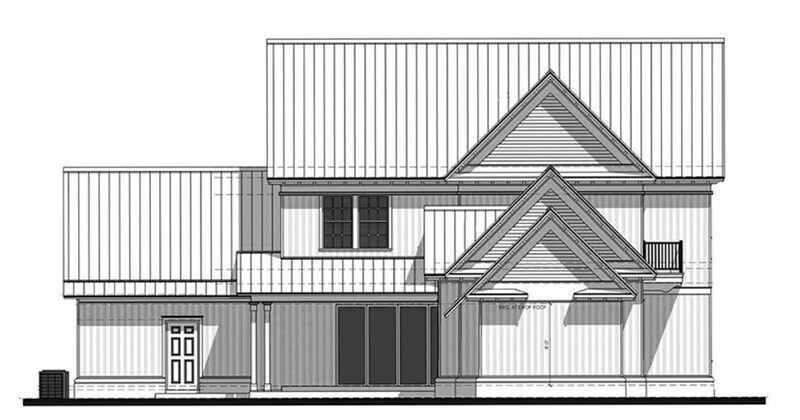 Average price for the Donald Garnder plans pdf file is $1335.